Colossalcon 9 last year debuted what has to be one of the coolest Masquerade prizes ever; 5 days and 3 nights in Tokyo for you and a guest. The con is big on cosplay, but that’s taking the dedication above and beyond! And the Japan Trip prize will be awarded for the second year come this June. By which time the prospect will be a more pleasing one – knock on wood. 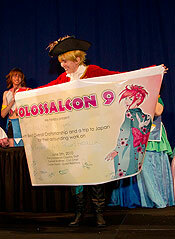 Harl, 2010's winner of the Japan Trip for her awesome period-accurate England from Hetalia. Of course, being a cosplay-loving event, Colossalcon still wants to see your non-Asian source inspired costumes as well. And getups not of East-Asian origin are encouraged for entry in their Friday cosplay event. In addition to the continental caveat, a costume must be made at least 70% by the entrant to be eligible for the Japan Trip prize given at the Masquerade. Heavily modifying existing parts or styling a wig seems to count as “made by you”. Pre-made/store-bought, commissioned, or rented costumes are right out, Japan Trip prize consideration-wise. Registration for the Masquerade opened on Saturday March 1st and pre-registration is highly encouraged. Colossalcon 10 is scheduled for June 2-5, 2011, and will be held at the Kalahari Resort in Sandusky, Ohio. The event is dedicated to anime, gaming, and Japanese culture. I would love to win this trip to Japan. We have never been, and this would be a wonderful way to say thank you to my fiancee who has taken care of me, since my major stroke 10 years ago.